3M’s Health Care Division invited my 3-person team to propose a multi-touchpoint strategy for a product ecosystem surrounding their Scotch Cast system, an innovative material for making lightweight fiberglass casts for patients recovering from bone fracture. Our challenge was to improve access to meaningful information for both medical practitioners and patients — as well as their families & caretakers, all while reducing the cost of care. From secondary research provided by the client, it was clear that the major pain points were related to the patient’s own self-care responsibilities. This could have major implications for patient, doctor, and insurer alike, since non-compliance or other unforeseen circumstances can be life-threatening and costly. We sought statistics on which group of patients would stand to benefit most from an improvement in monitoring and communication. Because they are a growing demographic who often face additional challenges with everything from dementia to limited mobility, we chose to focus on adult patients over the age of 65. If our product could prove its effectiveness in reducing complications for this vulnerable group, it could be expanded and adapted for anyone from athletes to children. Because older adults do not always adopt unfamiliar technology, we wanted to make sure our system was able to transmit important information via SMS or email — in addition to a proprietary mobile app that would deliver the best range of features. Voice control is a major selling point of the patient-facing app that we believe would help serve patients with restricted mobility. The patient participates in automated checkup surveys, receives reminders about their care plan, and is able to efficiently transmit special concerns to their physicians. A dedicated call button can request a call from the medical team or connect to 911 in case of emergency. 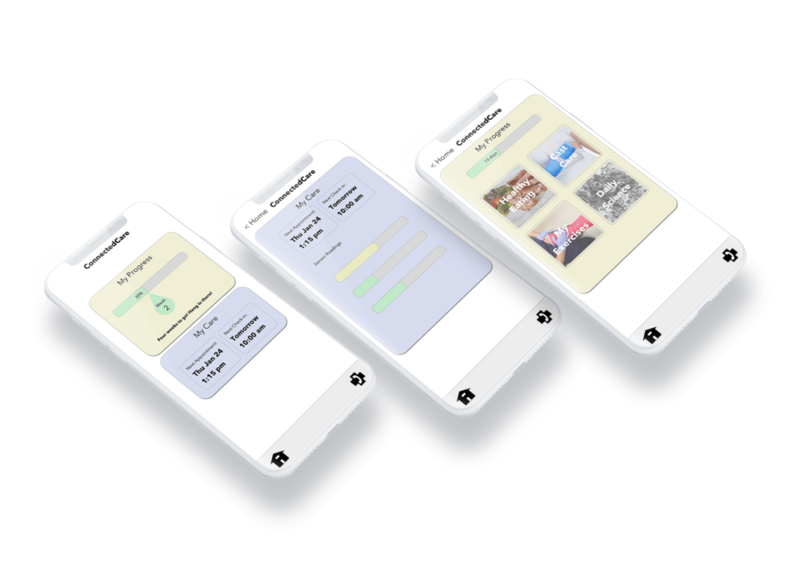 The patient app helps the patient stay engaged with their recovery process through personalized updates about their progress, reminders about proper maintenance of their cast, dietary advice, and access to general information about their injury.